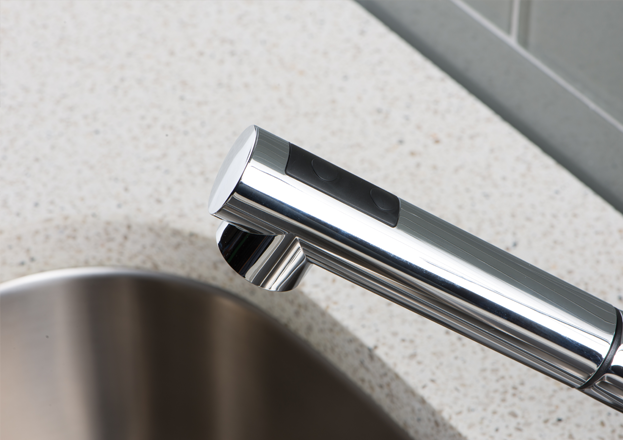 Clean and minimal, this faucet features a single top-mounted handle and a cylindrical body that’s versatile enough to look at home in a variety of kitchen settings. 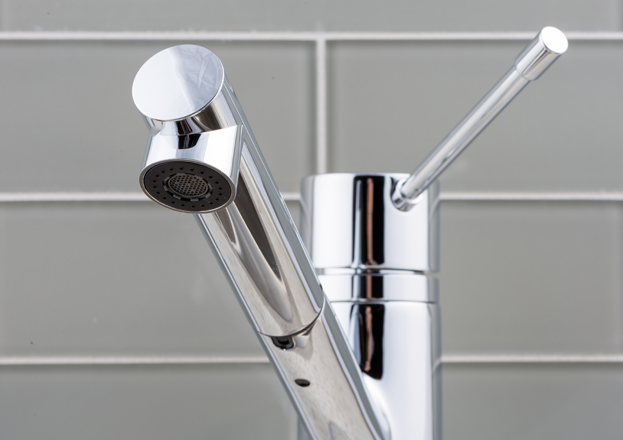 The long rotating spout with pull out sprayer includes a longer handle for maximum comfort and two water flow options. 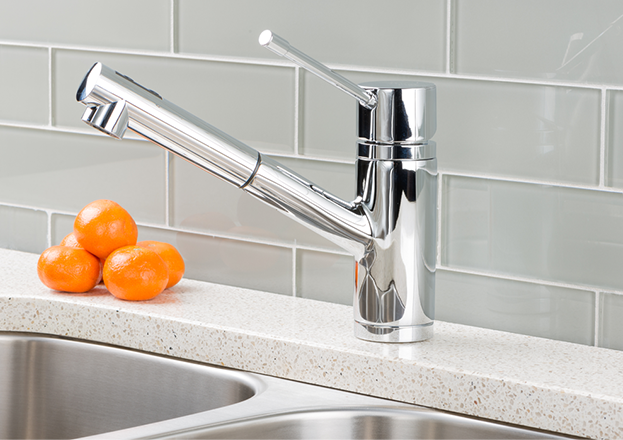 Enjoy the sleek modern aesthetics and multifunctional design of this Hahn kitchen faucet. 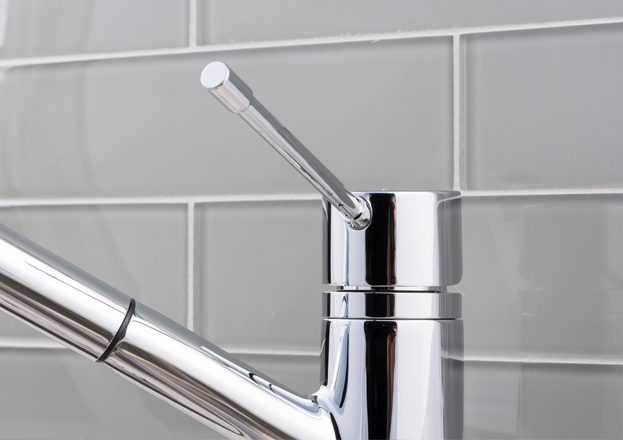 The faucet delivers a unique twist on contemporary fixtures that’s sure to delight and inspire. Combined with Hahn’s signature intelligent design features, the result is distinctively glamorous. Enjoy maximum visual impact with modern multi-layered chrome plating that resists discoloration, corrosion and tarnishing. 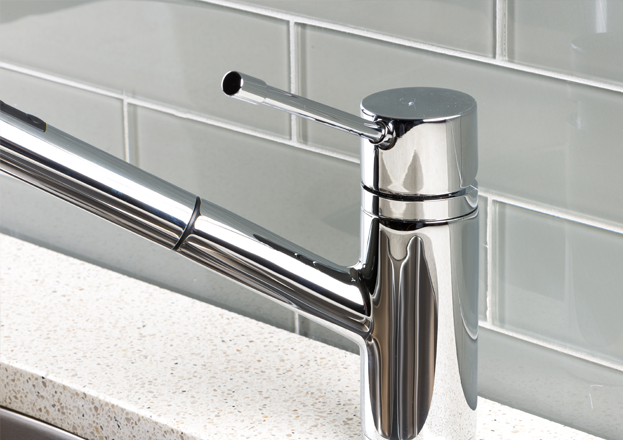 This ultra durable, sleek finish means your faucet will remain as beautiful as the day you bought it..
Crafted with style and functionality in mind, the long spout, top lever handle, and easy push button control maintains the contemporary charm of the faucets appearance while ensuring simple operation. 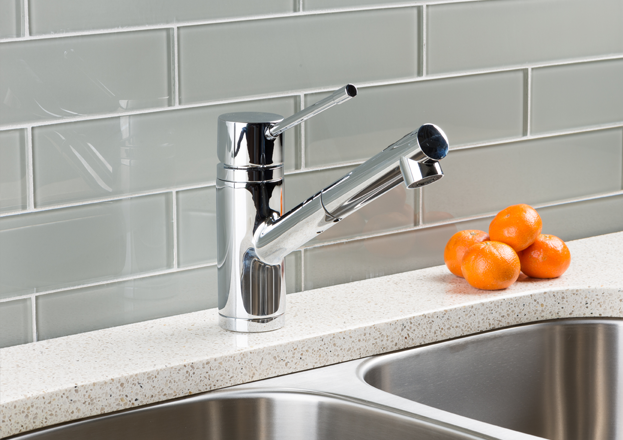 Combining graceful stature with optimum comfort, this Hahn kitchen faucet features an ergonomic top-mounted lever handle that is simple to use and makes water temperature adjustments a breeze. The smooth transition from hot to cold water provides accurate temperature control and quick changes in temperature. The long rotating spout offers a full range of motion and provides superior clearance for filling even the tallest pots. he convenient two-function spray head allows for up close, effective cleaning, and can switch between a wide, full spray to an aerated jet spray with the push of a button. The spray head is equipped with secure docking features and a pull out hose to allow for maximum maneuverability. 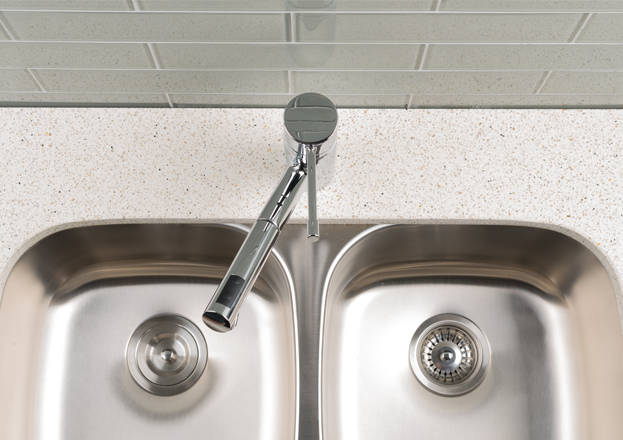 Hahn faucets have as many advantages under the counter as on top. The extra long metallic pull out spray hose (60”) allows you to reach far corners of your kitchen and fill pots and water vessels easily; flexible color-coded supply hoses require only a single push to connect, making every installation a cinch. 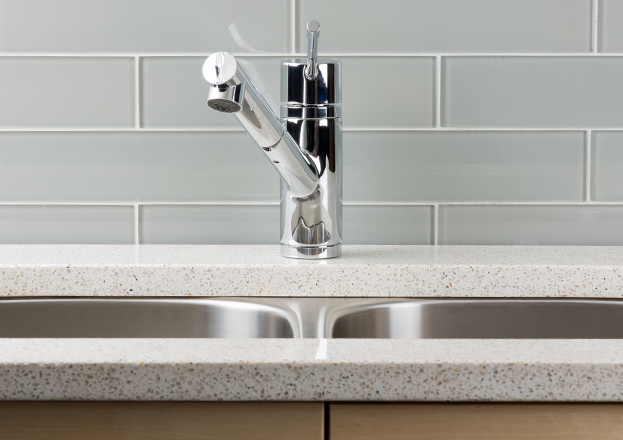 Your kitchen faucet is one of the hardest working fixtures in your home, so you want it to be reliable and maintenance free. That’s why Hahn faucets are made from only premium metal. This faucet’s lead-free, solid brass body construction is designed for long lasting durability, while European quarter turn ceramic disc cartridges ensure drip-free performance for life. Hahn’s fully integrated manufacturing facility means all manufacturing and assembly – from casting to finish – is done under one roof. 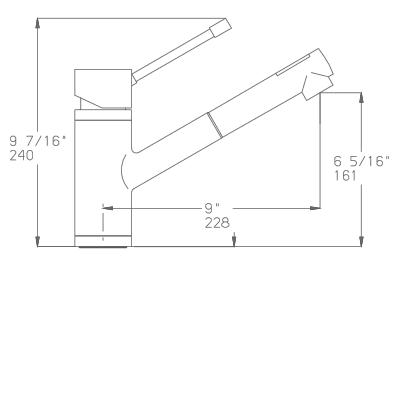 All our faucets are inspected and tested during each stage of the production process. As a final inspection, every Hahn faucet is water tested before leaving the factory.